EMPLOYERS ARE TO OPERATE USC STRICTLY ON THE EMPLOYEE ASSIGNED USC RATES AND CUT-OFF POINTS AS ADVISED BY REVENUE IN THE P2C FILE, WITHOUT EXCEPTION. Employer Tax Credit Certificates (P2Cs), display PAYE credits and cut off points and also USC rates and cut off points. The Forms P45 and P45 Supplement include USC details. It is NOT the responsibility of the employer to determine amendments to the operation of USC based on an employee’s personal circumstance. Where lower rates of USC apply in certain circumstances, for example, in the case of employees aged 70 and over whose aggregate income is less than €60,000, or where employees hold full medical cards whose aggregate income is less that €60,000, these lower rates will be stated on the P2C issued by Revenue. Where lower rates are not stated on the P2C currently held, the employee should be advised to contact their local Revenue office in order to update their USC status with Revenue. The 2018 USC exemption income threshold is €13,000. Where Revenue determines that a USC exemption applies, it will be advised to the employer on the P2C. The employer does not make any adjustment unless advised to do so via the P2C/Tax Credit Certificate issued to them for an employee. No cut off points are allowed. 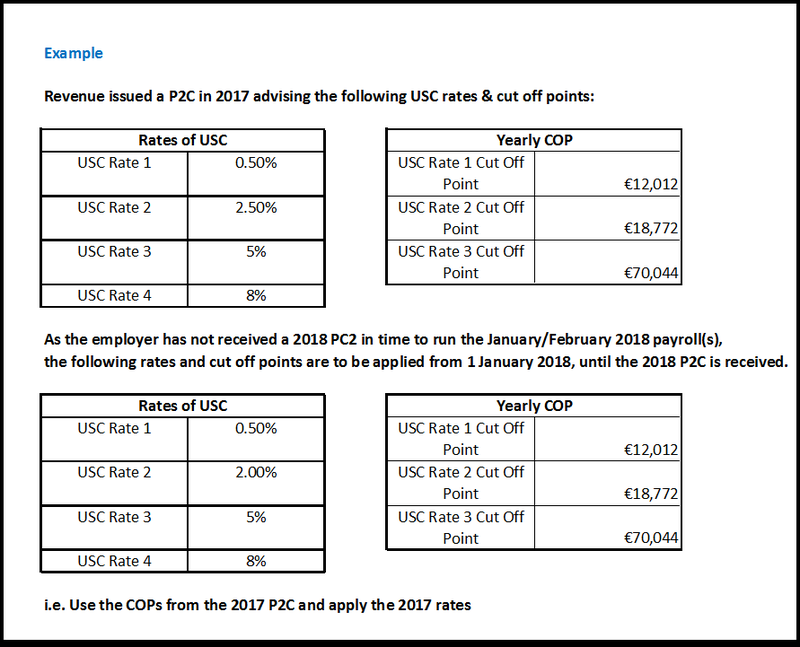 The emergency rate of USC is the highest rate applicable to a PAYE employee, currently 8% for 2018. While the rules applicable to emergency tax operable in PAYE include a gradual escalation in emergency tax rates over a given period, in USC there is just a flat % rate (with no cut off point) applied to all payments. What are employers to do where they have not received 2018 P2Cs in time to run January 2018 payroll(s)? The rates and some thresholds of the Universal Social Charge (USC) are changed with effect from 1 January 2018. In December 2017, Revenue issue to employers/pension providers 2018 Tax Credit Certificates (P2Cs) for all employees, advising the rates and thresholds applicable from 1st January 2018. Employers should continue to use the 2017 P2Cs for tax deductions. BrightPay will automatically apply the above 2018 rules on import from 2017 as appropriate. Where USC Exemption was advised in the 2017 P2C, employers should continue to apply USC Exemption from 1 January 2018, until the 2018 P2C is received. Where the emergency basis of USC deduction applied, employers/pension providers should continue to apply the emergency basis of USC from 1 January 2018, until the 2018 P2C is received. The 2018 emergency USC rate is 8%. It is imperative that once 2018 P2C files are received by an employer that they are imported into BrightPay 2018 immediately and before any further payroll is finalised. On the P45 there is a dedicated section for the return of USC information, this must be completed by all employers when an employee ceases to be employed by them. When a new employee starts in your employment and provides you with a 2017 P45 with standard rates, employers should continue to use the 2017 COPs and apply the 2018 rates on the temporary basis. They are to be used on a week 1/month 1 basis until advised otherwise by Revenue on the P2C file. The annual income exemption threshold of €13,000 applies for 2018, the process of employee self election to Revenue still applies. Where Revenue determine that the employee/pensioner’s total annual earnings (from all USC-able sources) will not exceed the USC exemption threshold of €13,000, the USC exemption will be stated on the P2C issued by Revenue. This USC exemption marker is an instruction to the employer/pension provider not to deduct USC from payments being made. Where the employer holds a P2C which does not show exemption and the employee/pensioner advises them that USC exemption applies to them, the employee/pensioner must contact Revenue themselves to inform Revenue that their earnings will not exceed €13,000 in the tax year. Revenue will then issue a revised P2C to the employer with an updated USC instruction. Once a new P2C is used to the employer which indicates that USC exemption is to be operated then any previous USC deducted will be refunded to the employee on the subsequent payslip. Employees > Select the employee > Click the Revenue Details tab > Tick to exclude the employee from the week 53/54/56 USC concession > 'Save Changes'.